Last Friday evening at Holy Cross Cathedral, we welcomed almost 40 visitors from France, who were here in Boston for the weekend’s Magnificat magazine Pilgrimage of Hope. 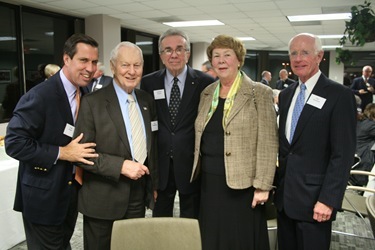 In the delegation from Magnificat were the publishers, Pierre-Marie Dumont and his wife Bernadette, the Archbishop of Bordeaux Cardinal Jean-Pierre Ricard and Archbishop Robert LeGall, the Archbishop of Toulouse, France. 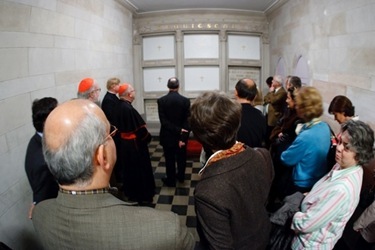 Father Kevin O’Leary, who speaks French very well, gave them a tour of the cathedral, including a visit to the crypt where the bishops are buried. They said they were very impressed by the beauty and size of the cathedral. 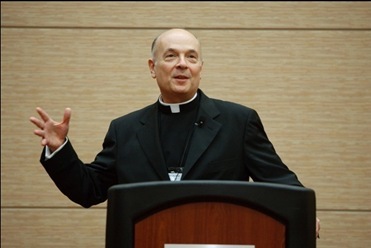 After my welcome, Cardinal Ricard gave us a wonderful talk on Bishop Jean-Louis Cheverus, the first bishop of Boston. 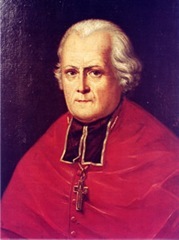 Bishop Cheverus left Boston to return to France, where he became the archbishop of Bordeaux and a cardinal. 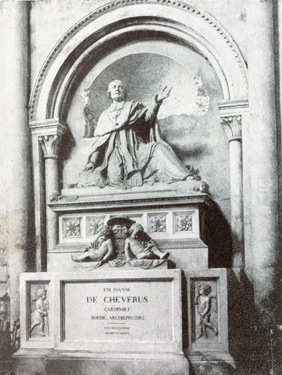 He is buried in a magnificent monument in the cathedral in Bordeaux. He is remembered very fondly for his ministry there. At the Pilgrimage, we were so pleased by the wonderful response of the 1,600 people who gathered for the talks, Masses and other events. 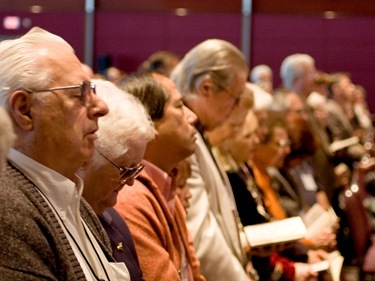 The Pilgrimage, like the magazine, made a positive contribution to helping people develop a liturgical spirituality and an understanding of the Church’s prayers, which leads them to the liturgy with great beauty and great dignity. There were a number of musical presentations, including a performance by the Boston Boy Choir on Saturday. The choir is based at St. Paul’s in Cambridge. 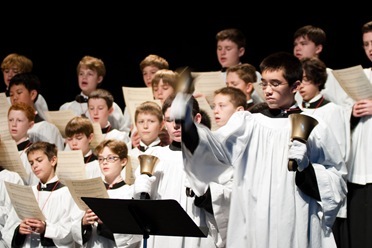 The boys attend the Boston Archdiocesan Choir School, which is a day school with rigorous musical training and full academic instruction. Although it is a very prestigious school, the students are not charged tuition. Because they are expected to perform at Masses and concerts, they are given what the school calls a “working scholarship.” There are auditions for fourth graders every spring for the next year’s new class. Click the button below to listen to a recording of their performance at the event. 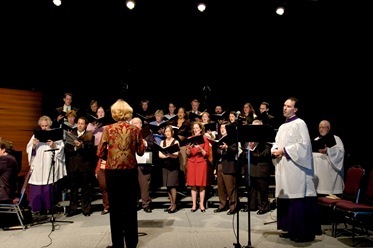 The musical centerpiece of the Pilgrimage was the Saturday evening concert, “Magnificat in Music.” It was an exploration of the how the Magnificat has been portrayed in music going back 1,000 years. The program closed with the playing and singing of Bach’s “Magnificat” with a full choir and full orchestra. I preached at the Pilgrimage’s closing Mass and at the end of the service I gave an Apostolic Blessing to those present, which included a plenary indulgence for those in attendance who had a spirit of conversion and detachment from sin, had recently gone to confession, received Communion and prayed for the Holy Father’s intentions. 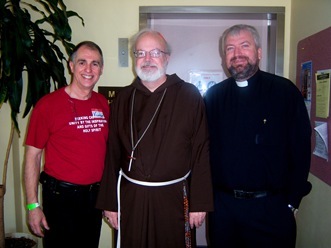 We were so grateful to Father Romanus Cessario, a Domincan, who is the magazine’s senior editor and a professor at St. John’s Seminary, and Father Dan Barron, an Oblate of the Virgin Mary here in Boston and the editor of the children’s edition called, “MagnifiKid!,” for their work here locally making sure the Pilgrimage was a success. I also want to recognize the leadership of Father Peter Cameron, who is also a Dominican and the editor-in-chief of the English edition. 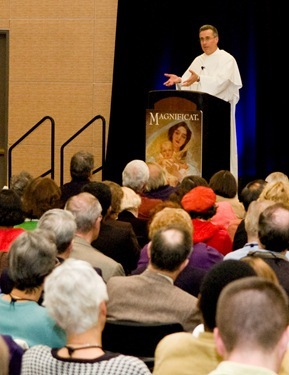 “Magnificat” began in France, but now its largest edition is printed in English, with more than 200,000 subscriptions in America. Also, there are now editions in Spanish and German. 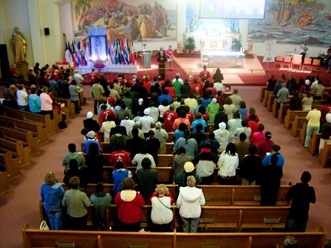 On Saturday morning I visited the Archdiocesan Charismatic Renewal Conference at Madonna Shrine in East Boston. 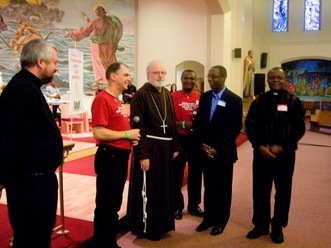 It was a wonderful blend of various charismatic prayer groups and their leaders representing the Anglo, Brazilian, Hispanic, Haitian, Nigerian and Ugandan communities of the Archdiocese. I’m so grateful to Vin Cerasulo, Director of the Archdiocesan Charismatic Renewal, for his efforts in my name to bring together all the different ethnic groups. On Saturday afternoon, the 10th, Bishop Antonysamy Francis of Kumbakonam and Fr. 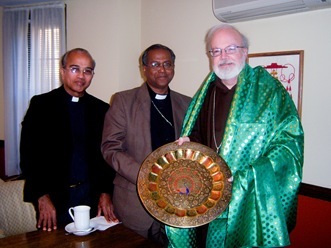 Selva Raj came to visit me at the Cathedral bearing gifts from India. As you can see they dressed me in a traditional Indian garment, in “Kelly Green”! 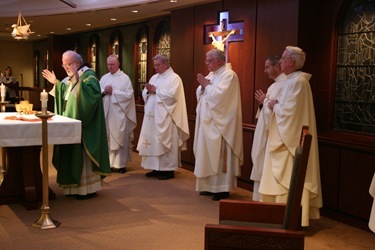 Tuesday evening we had a Mass in Bethany chapel and an appreciation dinner for all the all lay volunteers, who do so much for the different boards and commissions and serve on the Pastoral Council. 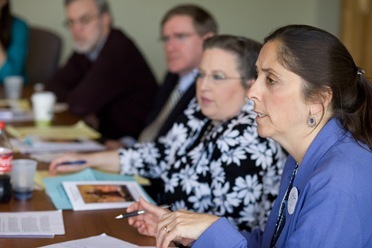 Wednesday morning we met with the Pro-Life directors of New England. We reported to them on the successes of our Pro-Life Sunday and the great participation of the young people at our Pro-Life youth Rally. You have a beautiful congregation, its quite inspirational. I am a Catholic myself, but I have been lost for the last 3 or 4 years. 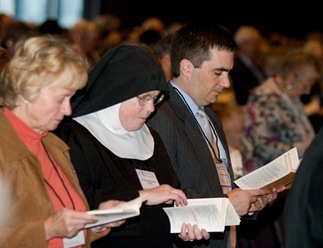 I feel like I need to find my own catholic family, I have been trying many different churches in my area, but I want something I can really become involved in. Can you give me any suggestions for for the sacramento area?? 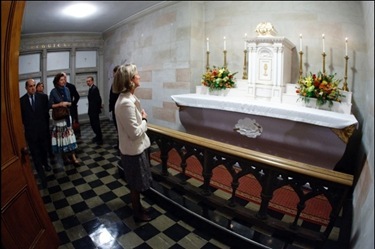 I think the photos of the crypt above are very interesting. I spent a week in Italy last year visiting various churches, including St. Peters and the Vatican in Vatican City. These old churches tell such compelling stories of different cultures and the history of the area. Very nice. Thanks for the photos! I just heard about the 2008 pilgrimage, how do I hear about the next one, hopefully 2009? 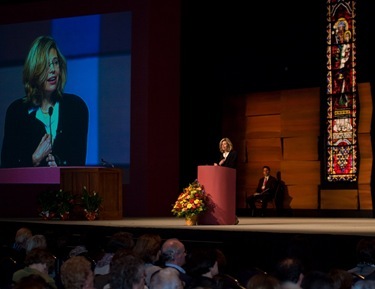 It most certainly sounds inspiring, and I should love to participate in the next. Thank you. I am a fairly new subscriber to the Magnificat. It’s increasingly these days being said that the “Catholic vote” may well be decisive next week. 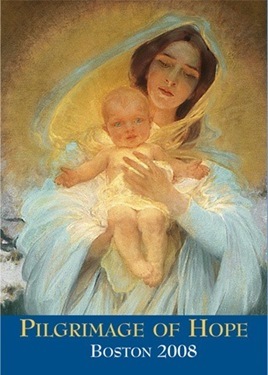 Given Sen. Obama’s demonstrated willingness to allow the death of babies born alive due to “unsuccessful” abortions, and his open advocacy for the Freedom of Choice Act, which will destroy all successful pro-life initiaves since 1973, there can be no doubt but that you and your brother bishops urgently owe it to your flock, to our Lord, and to the whole of society, to speak UNAMBIGUOUSLY and FORCEFULLY about faithful Catholics’ moral obligation to refrain from voting next week for him, your tax exemption be damned. 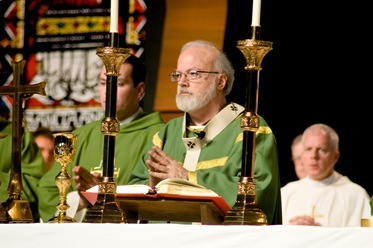 You are in my prayers, Cardinal Sean; thank you for your holy ministry. Hello! My name is Kiana and I am a student at St.Paul School in Hingham Ma. Our class commented a lot on your blog last year. I hope that this year we are going to do the same. last year we asked you to visit us. Our class still would like to see you. I love reading your, it is so interesting. You go to so many places and see so many different people. I hope to see you soon! May God bless you! The Ukranian Liturgy is absolutely beautiful. 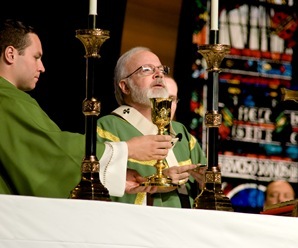 Thank you for posting some of the Eucharistic prayers here. 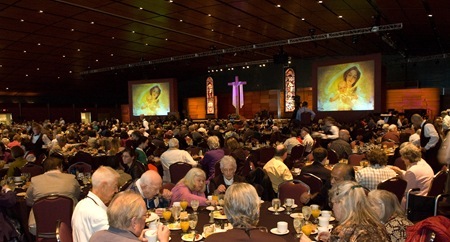 I attend that same liturgy from time to time at their church in Jamaica Plain and it is very edifying indeed. Tom Flatley was a great man and a very devout soul. 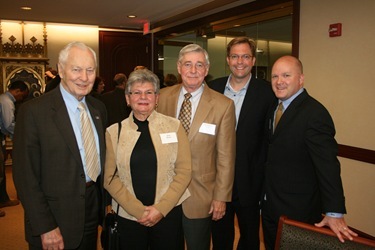 I had seen him over recent years at St. Agatha’s in Milton as he went on a daily basis. God bless his family. Thank you for sharing the beautiful photos of the icons and iconostasis in the chaple of St. Basil’s Seminary in Stamford. You are indeed correct that the chapel is bigger than St. Vladimir’s Cathedral down the street from the seminary. 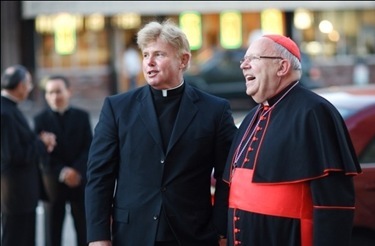 I visited both places in 1979 when Bp Losten was the bishop. God bless you and yours! I really enjoyed this post and the photos were wonderful. I hope that you are well. You are frequently in my prayers. I know you have a very hard and unpopular job but you have my heartfelt respect. I read CNA everyday and I am so proud not to see you on there with your Brother Bishops. Many of their actions and preachings grieve me. I feel like my Church has been hijacked as a reaction to the sexual abuse crisis. Just yesterday I read Martino’s rejection of the USCCB. 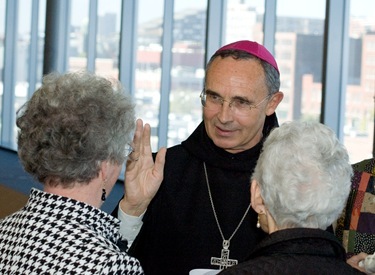 This lack of collegiality is a horrible example for the Church and for the world. 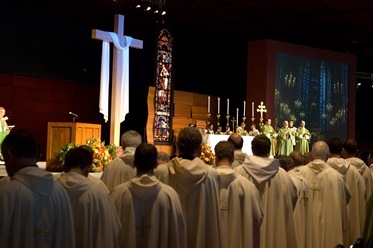 Just the other day a religious told me he went to a conference where the Priest declared that “the servant model of the priesthood is dead”… and people cheered. This is horrifying. 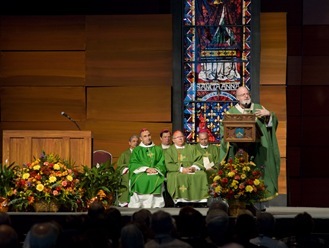 The Bishops’ pro-life stances are becoming unkind and less about the humble good shepherd leading his flock to genuine truth. I am as pro-life as anyone can be but I cannot see my stance as a substitute for being charitable and compassionate to those who disagree with me. 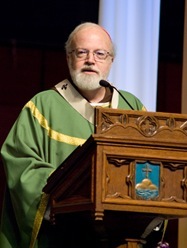 Cardinal Sean, I wish more Bishops followed your example. I don’t know why I am writing this to you but as an unworthy prophet, I beg you to pray about this. Thank you so much for your inspiration. I was once a lost soul, but I returned to church after many years of being away, because of someone just like you who taught me that JESUS loves me. Now I spend my time bringing Jesus to others, through the website I created and the games / tools I created to help teach and learn about Our Faith. I also volunteer as much time as I can in the same church I was baptized, made my first communion, and was confirmed in over a half century ago teaching children about their faith. So no one will ever loose their faith the way I did. God Bless you, and keep you with us always. I appreciate the work you are doing. I am a seminary student at Gordon-Conwell, and there are a few of us here, of whom I am aware, who respect you in Christ. 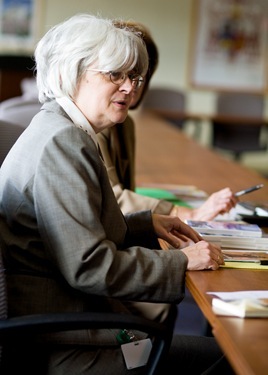 Many others are perhaps uninformed due to the pressures of academic life. May God’s peace and grace continue to attend your ministry, as you rebuild and restore His Church.